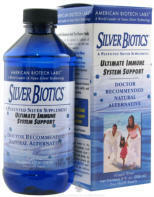 We have numerous resources for you to peruse regarding how to use our Silver Biotics products. First we suggest that you look at our Silver Biotics Frequently Asked Questions page where you can find answers to questions regarding safety, who can use the product, how long it will keep in storage, etc. Second, we suggest you look at our Silver Biotics Product Use page, where you’ll find general product usage information, as well as more specific suggestions on product use with common infection type situations. (Please, however always remember that these guides and suggestions are not to be used in place of seeing your medical professional.) Third, we suggest you look at the book, Silver - Nature’s Natural Healer and learn more about our particular Silver Molecule’s capabilities (the book is electronic form and is available free) at SilverInstitute.com. Americansss Biotech Labs products supply their powerful and effective “energized”, nanosized Ag 4 O 4 silver products in a variety of formats, for pets or people. We recommend you utilize them either daily, or as needed to help keep your life as free as possible from pathogens… because who needs a needless time and energy drain from pathogens? Our 10 ppm silver liquids come in four sizes: • 32 ounce (largest) • 16 ounce (large) • 8 ounce (medium) • 4 ounce (small - includes sprayer) Ingredients: 50 mcg of purified silver per serving. Other ingredients: deionized water. Prices (inclusive of standard US shipping) are $42.71, $30.71, $21.71 & $13.46, respectively. Our Professional 3X strength HealthMax™ (30 ppm silver) liquid product delivers 3 times more silver. Ingredients: 150 mcg of purified silver per serving. Other ingredients: deionized water. Contact us for additional details. 20 PPM Silver Biotics Silver gels come in two sizes: • 4 ounce • 1.5 ounce Ingredients: 20 ppm Patented Silver Solution (deionized water, silver), TEA and carbomer. The prices (inclusive of standard US shipping) are $18.71 and $8.62 respectively. Designed to clean your teeth like no tooth gel has done before. Ingredients: Silver Sol, Xylitol, 100% Pure and Natural Peppermint Oil The price (inclusive of standard US shipping) is $10.46.